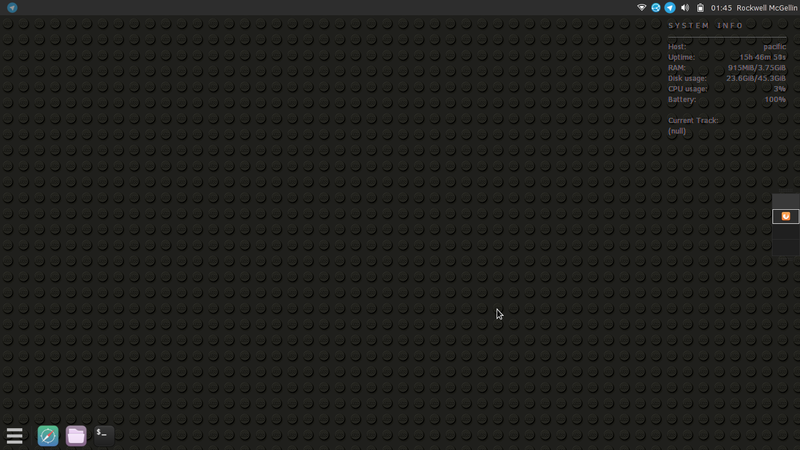 So I've been using the same tiling Lego stud pattern as my wallpaper for a couple of years now. I forget where I originally tracked it down - my brain seems to remember it may actually have been something a freelancer whipped up on spec for the actual Lego website. It came in a couple of colours, as - of all things - .gif files. All I know is that a) it looks amazing on any size desktop, because hey, tiling; and b) what I am about to do is thus not just one but two levels of intellectual property infringement. I've been playing around with my desktop environment recently and stumbled on a feature in my Linux that lets you set a different background for each virtual desktop. This is really cool - it makes it a lot trickier to lose that one window when its background was definitely bright red. I don't really go for bright red wallpaper though, especially not on bigger screens. So I make my own colours, by playing with sliders in image editing software. And I was halfway through redoing these yet again when I thought, "There's got to be an easier way." There is, but beware - we're going off the technical deep-end here. This environment actually lets you set a background colour as well as an image. Usually this would be seen as just the colour around the edges if you use a picture that's too small and choose to center it, but it turns out it's also the colour that shows through if your background image happens to be transparent. So, after some fiddling with the white version of the file, I produced a version that consists almost solely of an alpha channel. It's really just some appropriately placed Lego-shaped shadows. So I can set this guy as my background, and happily slide my way through my monitor's entire colour space on a whim, and have it look like a trippy, amazing Lego board. It is well past midnight and I have a Birthdays shift tomorrow, but I am so chuffed with this that I don't even care. Caveats: I have no idea if this will work on Windows or Mac, or even on Linux environments that aren't XFCE 4.12. Best I can do is say grab the file and give it a try. I also do not own the rights to Lego™, or indeed to the original file, for which I apologise. Here is how you do it programmatically - at least in xfce. Figuring out the xfconf-query was a bit tricky, so I'm posting it here mostly so that I remember.